Married Mabel May Hyde in St. Albans, Teddington. 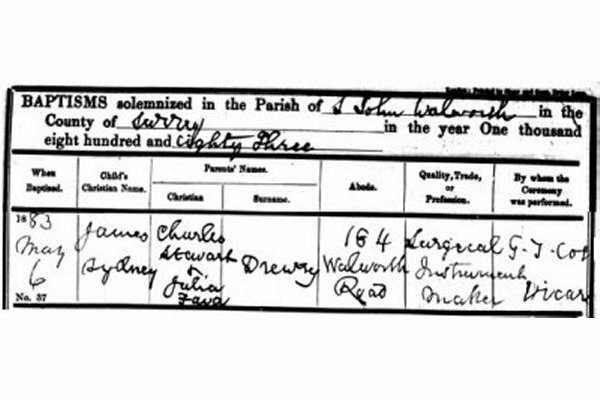 Birth of daughter Barbara Cecelia Drewry in Yardley, West Midlands. Birth of daughter Christine Hilda May Drewry in Hitchin, Bedfordshire. Designer/inventor; Locomotive and equipment builder. In January, 1889, enrollment in the Jessop Road (Lambeth) School record. He had already attended a Private School. 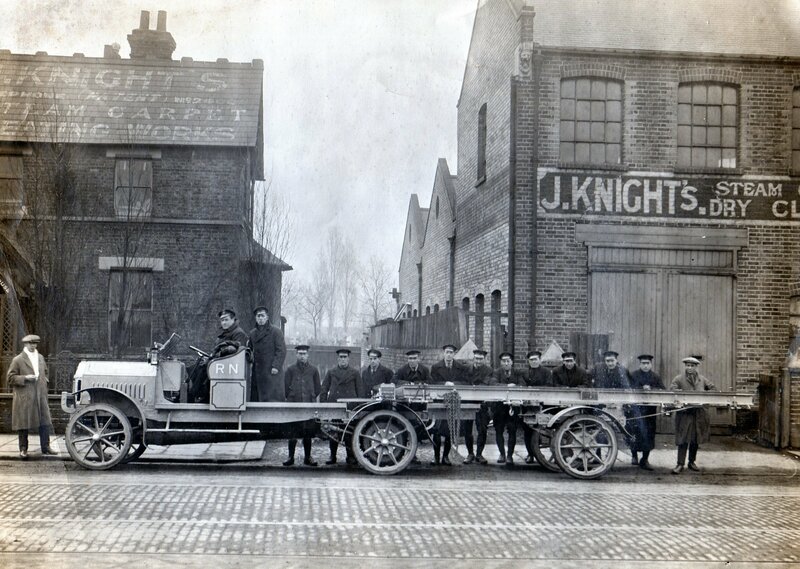 In January, 1894, in the Jessop Road (Lambeth) School record. (Click on the image for a full size picture). In his book 'Municipal Refuse Collection Vehicles', Barrie C. Woods suggests that James had "risen to fame with his petrol-driven railcar." 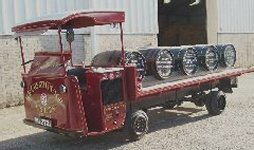 Is this the railcar? 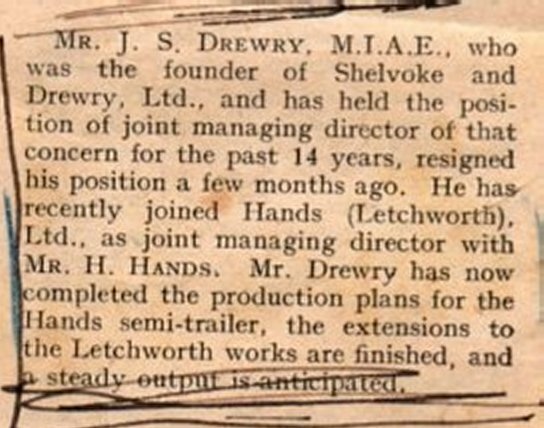 The cutting (see below) showing the obituary of James S. Drewry from a local Letchworth newspaper has an unfortunate fold where the text from the reverse side shows through. 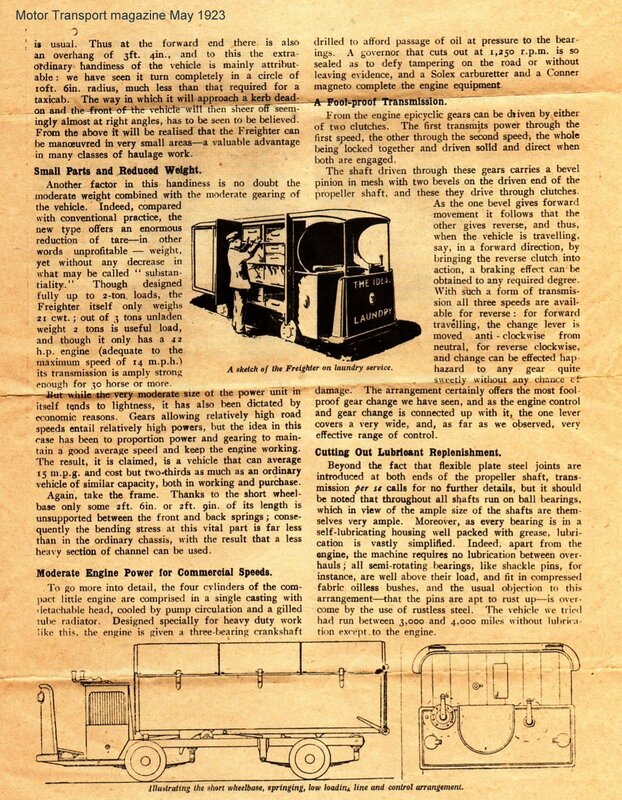 The owner of the cutting believes that the text says: "In 1903, at the early age of 21 he designed and manufactured the Drewry railcar .. which he later sold to the B.S.A. Co. of Birmingham". I believe the above photograph is from 1903 or 1904. Alfred (furthest from the camera) said he was sixteen when the photo was taken. 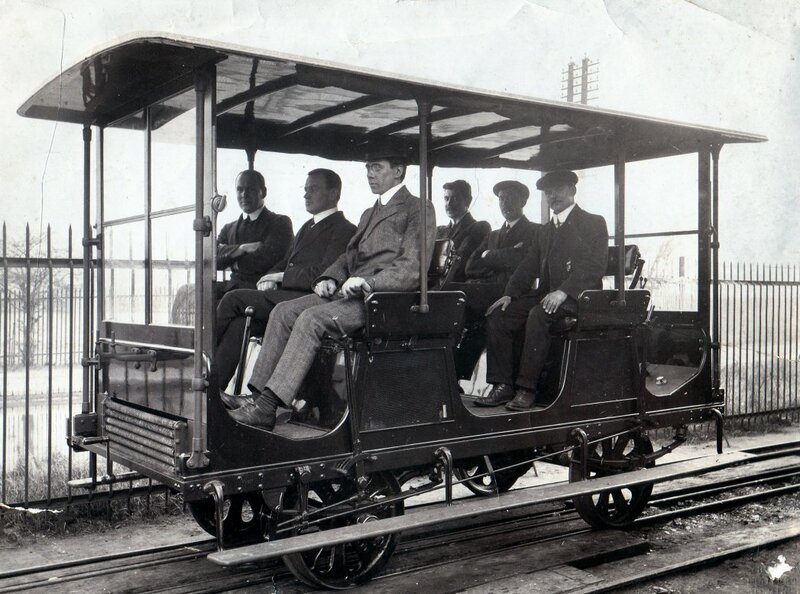 In 1902, James (the older of the brothers) took the railcar ('Trolley No. 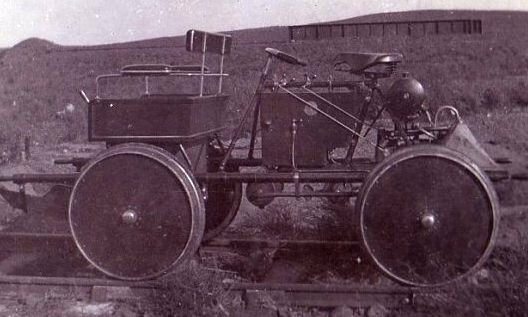 1' - in the pictures below) to South Africa where he worked on the proposed Cape-to-Cairo railroad. See photos of James Drewry in Africa, 1904-1906. The photos have captions dated 1904, 1905 and 1906. 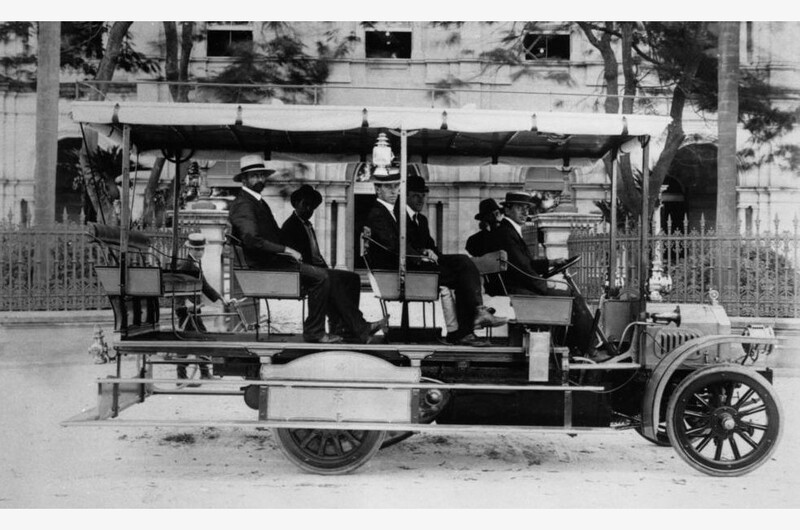 In one shot of James in Bulawayo, the date has been changed from 1905 to 1908. This could suggest he made more than one trip to Africa. 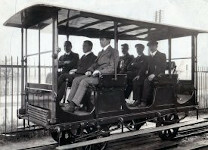 The railcar in the 1904 photo appears to be a redesign of 'Trolley Number 1'. 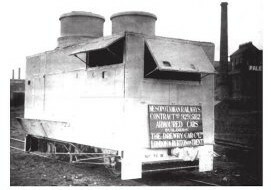 Recorded production of Drewry railcars began in 1905, probably as soon as James returned from Africa. 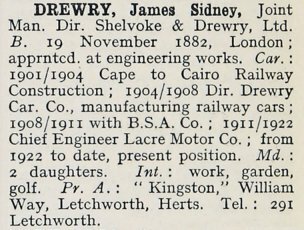 The entry in the '1934 Who's Who in the Motor Trade' says that James worked on the Cape To Cairo railway between 1901 an 1904. 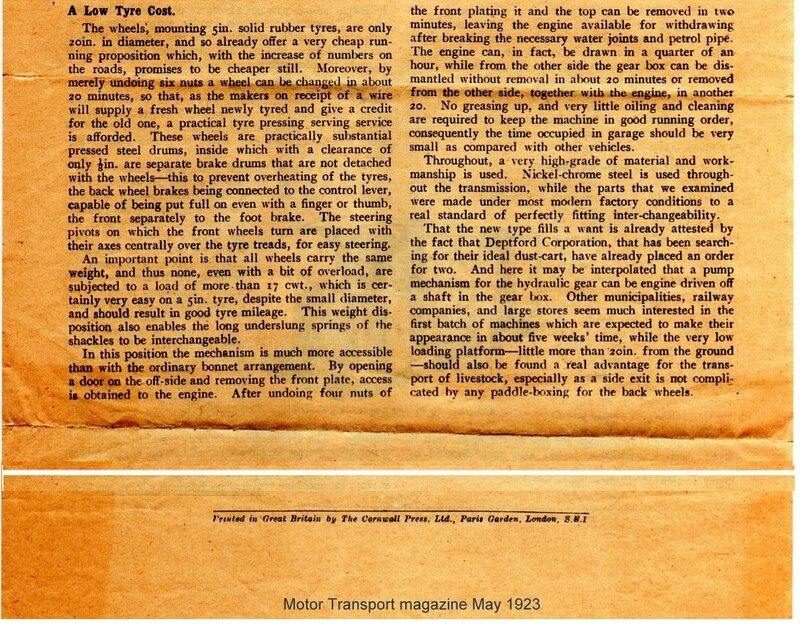 The cutting of James' obituary describes his work in South Africa as experimental. 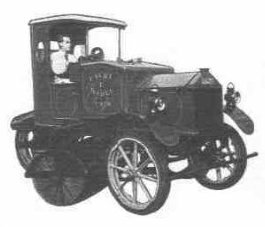 More information about The Drewry Car Co. and images of early cars can be found in Charles Stewart Drewry's page. 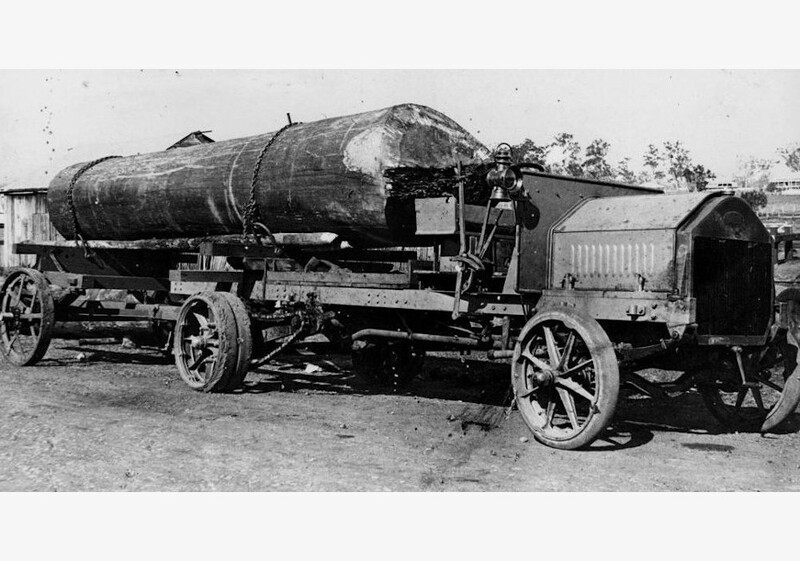 "James met Harry Shelvoke when Chief Engineer of Lacre. 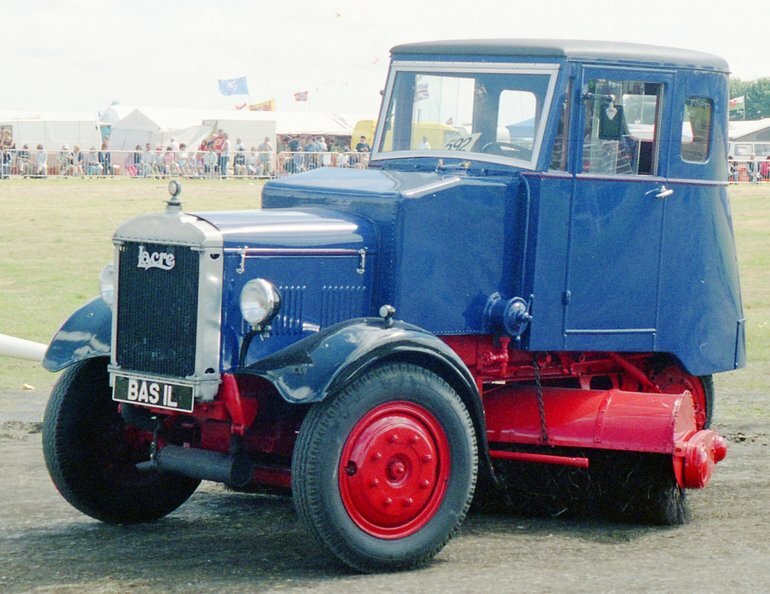 Subsequent designs were built by BSA, where he worked until 1911. 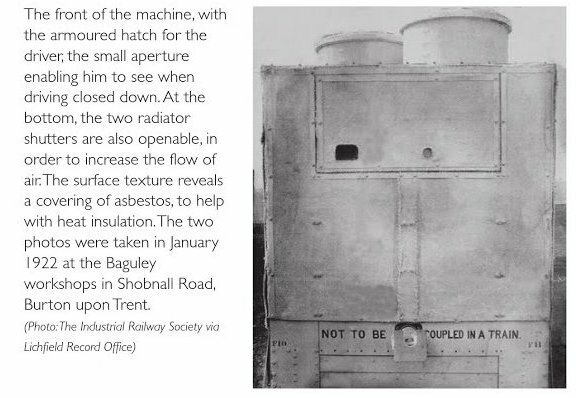 He was a partner in Baguley-Drewry." "Drewry was described as having the air of a slightly 'absent minded professor' type. 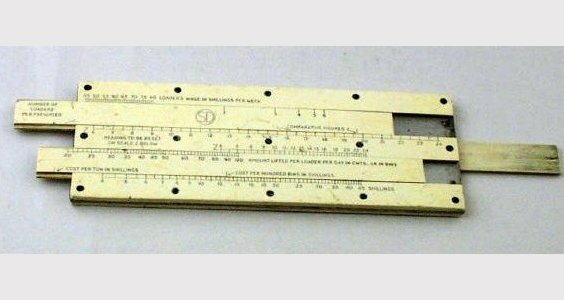 He was a greatly respected engineer". 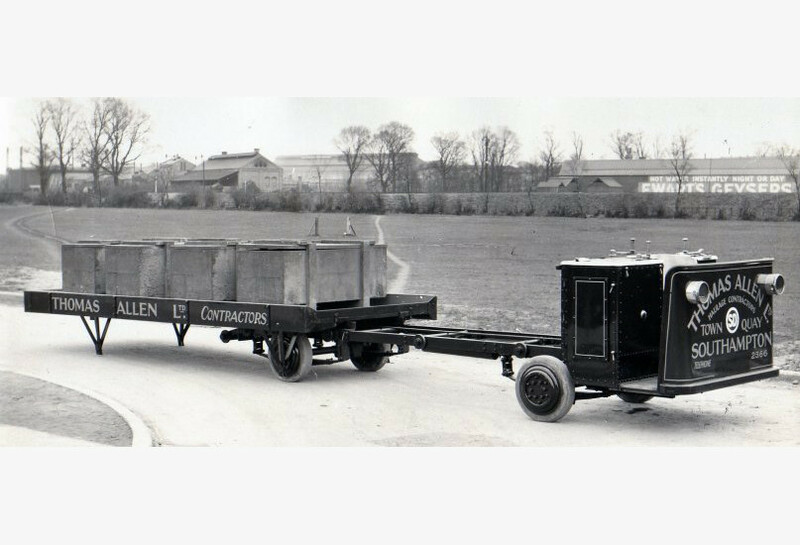 A 1920 version of the Lacre Roadsweeper, left, is at the Museum of Transport at Stondon, near Henlow, Bedfordshire. 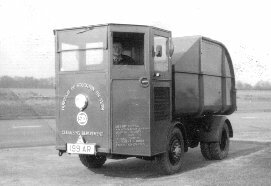 The vehicle was in use in Scotland until 1952. 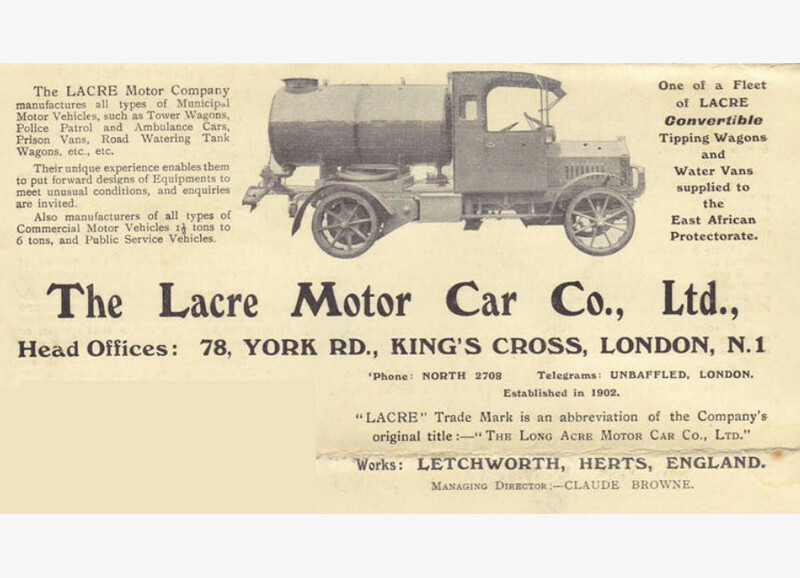 Lacre vehicles were exported widely. 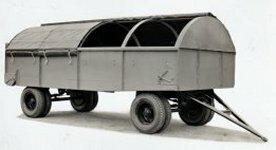 During the first World War James designed and produced pontoon equipment for the Belgian Army and was later decorated by the King of Belgium. 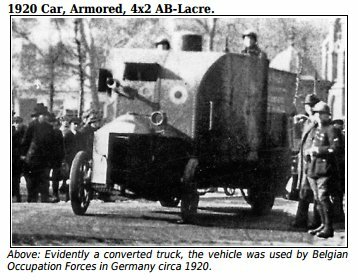 Lacre provided many vehicles to the Belgian and British armies. 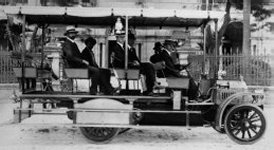 On the right is an ambulance car destined for the French Government and Mesopotamia. 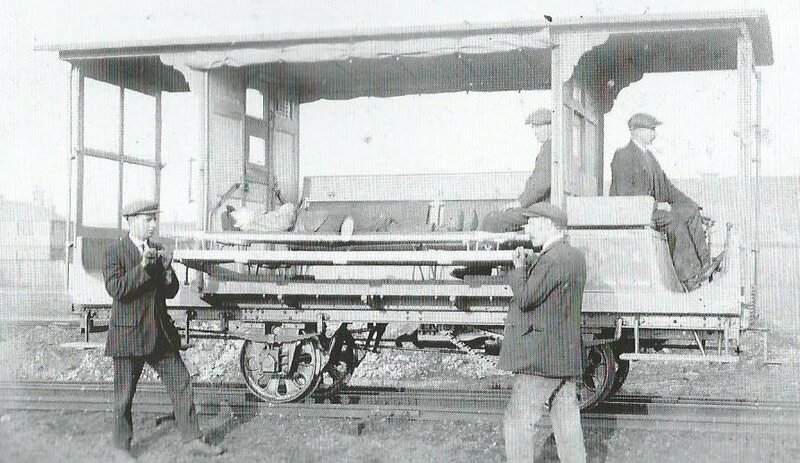 Baguley workers are demonstrating the loading of stretchers. 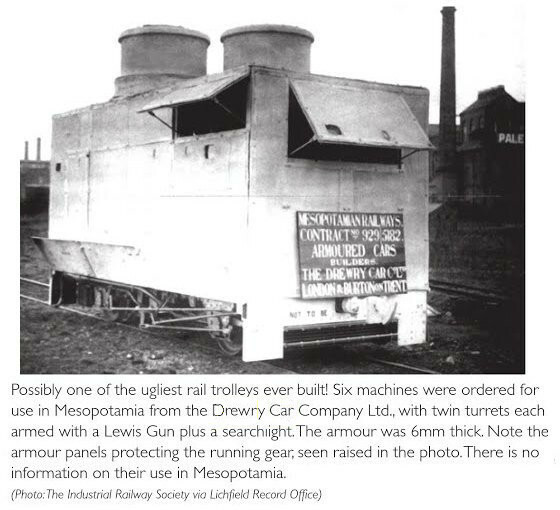 "Possibly the ugliest trolleys ever built". These were sent to Mesopotamia. 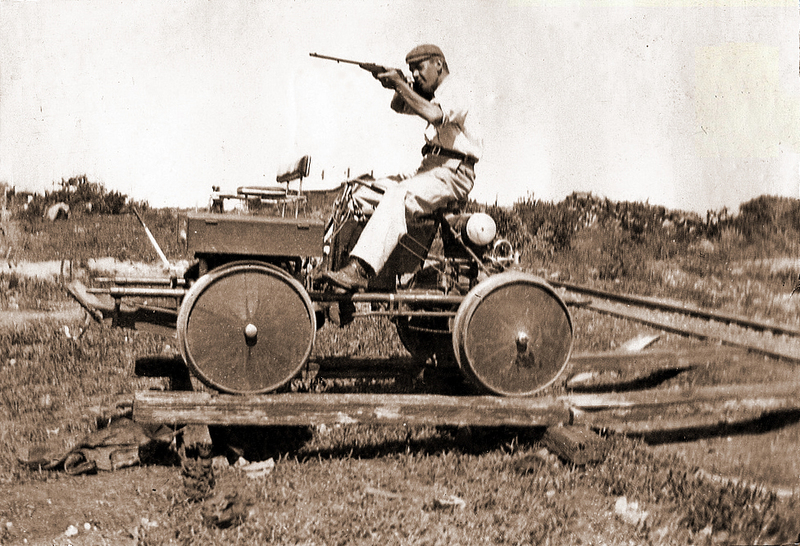 After the war James helped design the successful Lacre T type road-sweeper. 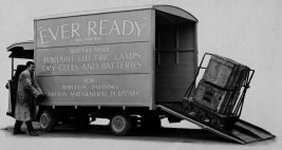 "James Drewry would come to the assembly benches to mull over design and production problems with favoured workmen over a four ounce tin of his favourite Afrikander tobacco." The next two pictures show James, first in a Rail Car and then at the S&D works with Freighter 1000. "The development of a power broom is thought to be the cause of friction between James Drewry and Harry Shelvoke." 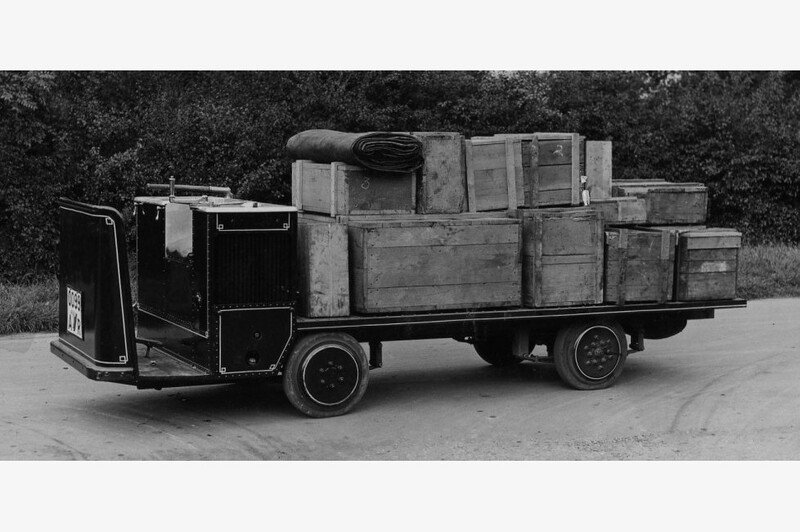 " In the mid 1930's Drewry left for a senior position with Hands Trailers." 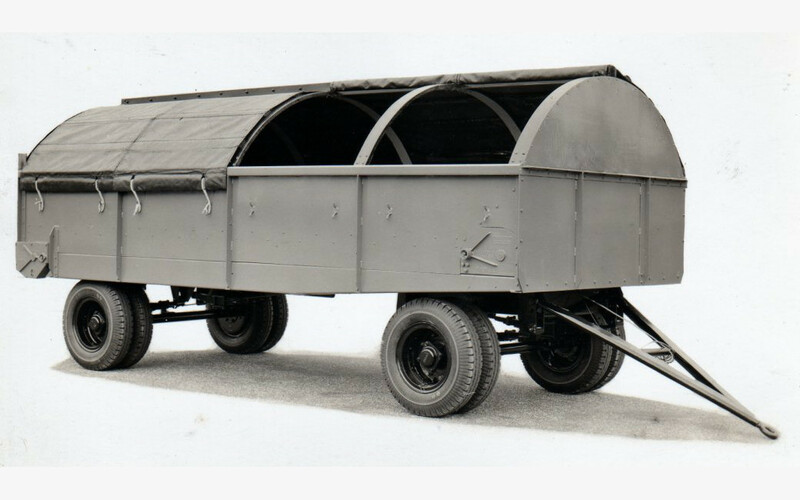 "For a while in World War II, James Drewry crossed the road to act as technical consultant on the tank trailers S & D were producing. 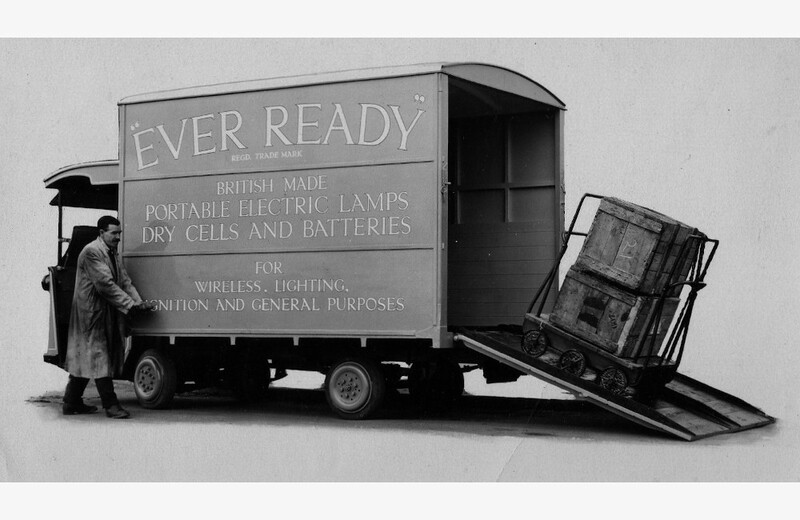 James Drewry designed one-man counterbalanced loading ramps for these trailers." 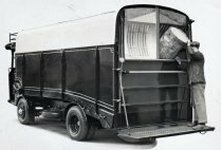 I believe that some of the work James did during the war is secret. 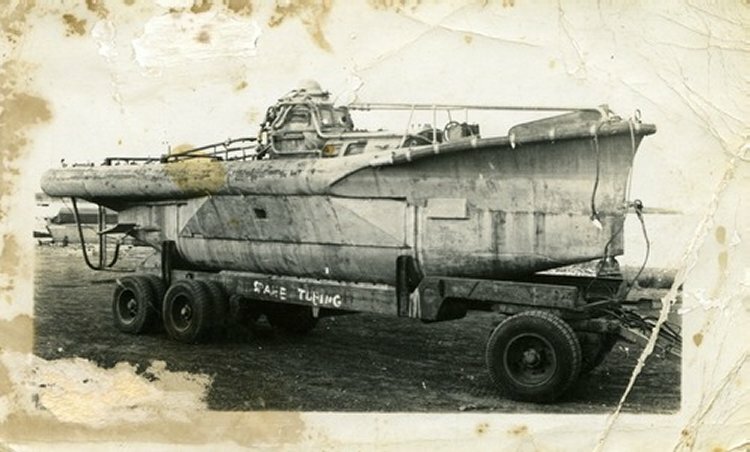 Vince, James' brother, said that during the second World War James was involved in the design of a mini-submarine (called the 'Welfreighter'). Surviving workers from the Welfreighter project have denied Jim's involvement. However, given the secrecy surrounding the project, it is quite likely that a person working on the project might not be known to others. Shop floor workers would not need to know who was involved in design and consultation. 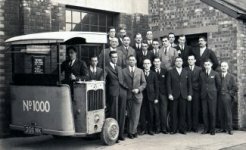 It seems very likely likely that an inventive engineer of Jim's standing (and renown) would have been called in to help with the project, particularly as he had been the design-engineer partner in S & D and was already working as a consultant in he design of tank trailers at S & D. He had also designed special equipment for the army during the first World War. 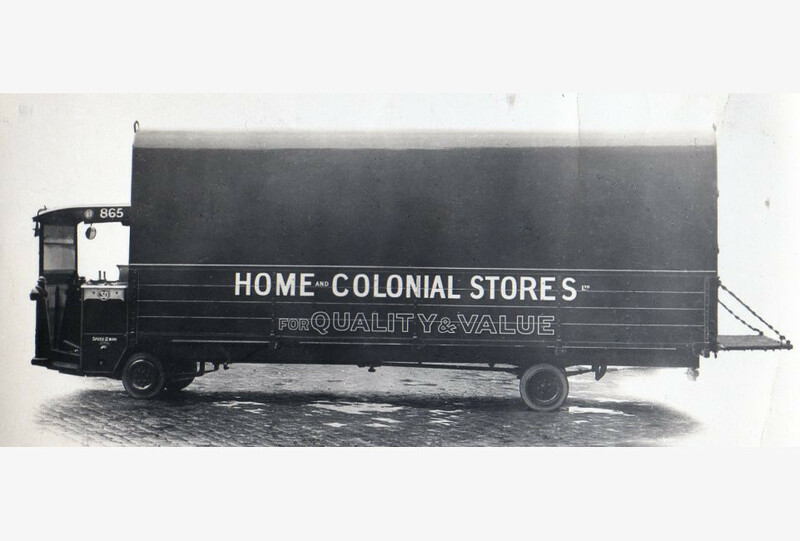 "The S & D company ceased trading in 1991, but the company is remembered with great affection". 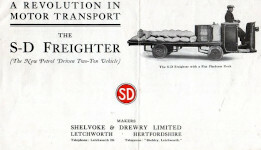 "Shelvoke & Drewry Ltd of Letchworth - makers of refuse collection vehicles, heavy duty fork lift trucks, and other specialised commercial vehicles. 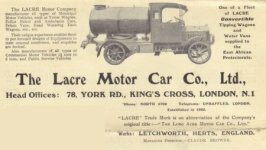 Harry Shelvoke (1878 - 1962) and James Drewry (1883 - 1952) were employed by the Lacre Company that moved to Letchworth Garden City in 1910. 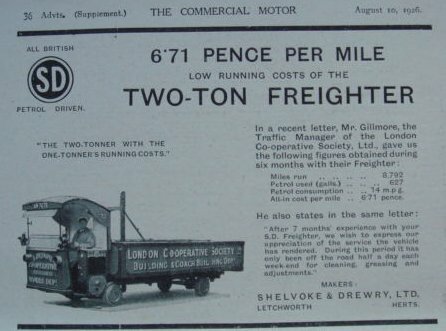 (Harry Shelvoke as General Manager, and James Drewry as Chief Engineer) They set up Shelvoke & Drewry in October 1922. 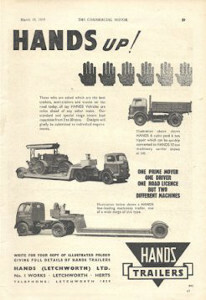 The company merged with W. P. Butterfield in 1966. In 1971 a merger with G. A. Harvey formed the Butterfield - Harvey Group of Companies. 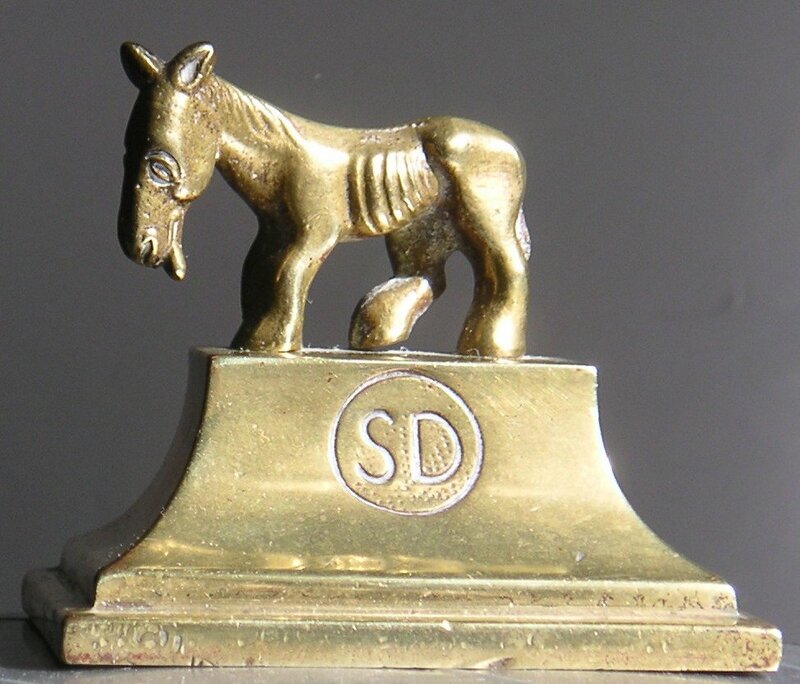 S & D was the largest subsidiary of the group." See also the S & D entry in Wikipedia. 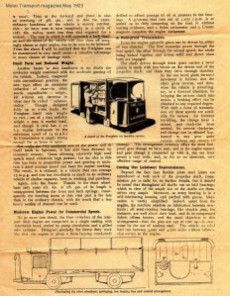 Some 50 or so patents that he held or was a partner in can be found at espacenet.com. 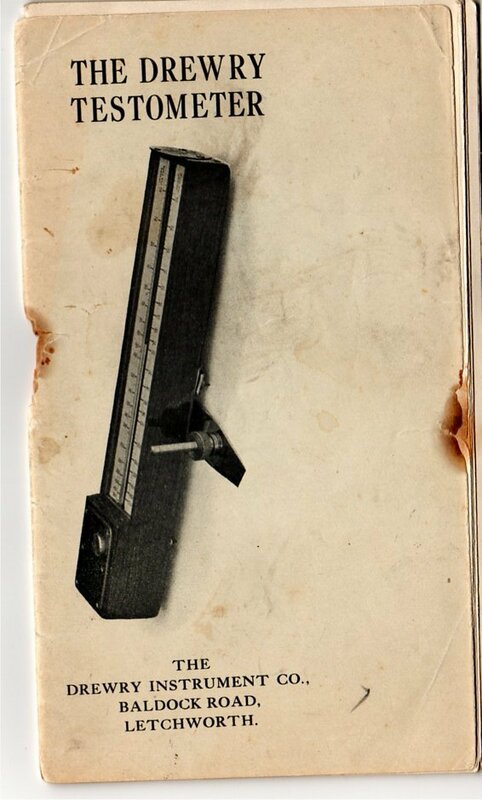 Clicking on the patent links provides descriptions and sometimes drawings of the patents. 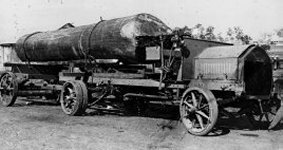 Some of the machines invented and built by James Drewry and Harry Shelvoke. A Web search (e.g. 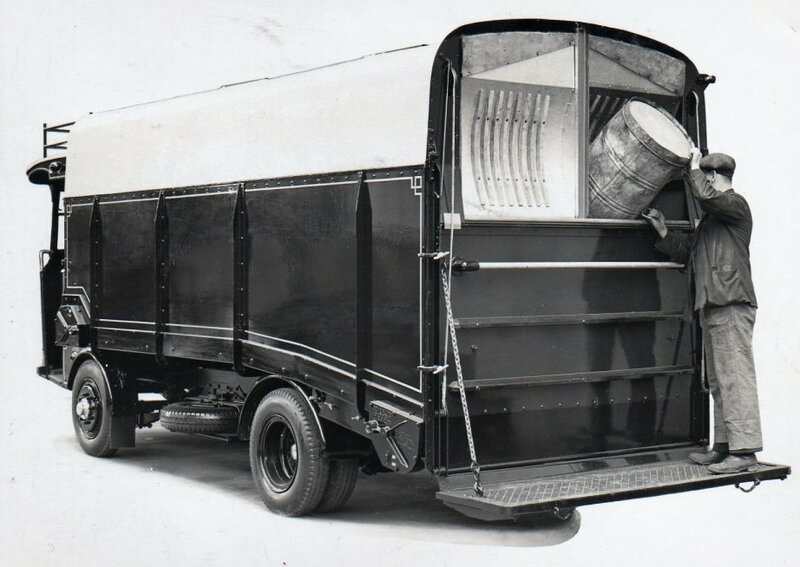 using 'Drewry' as criterion in an image search) will uncover a large number of Drewry machines and give an indication of the many countries in which those machines were operated. 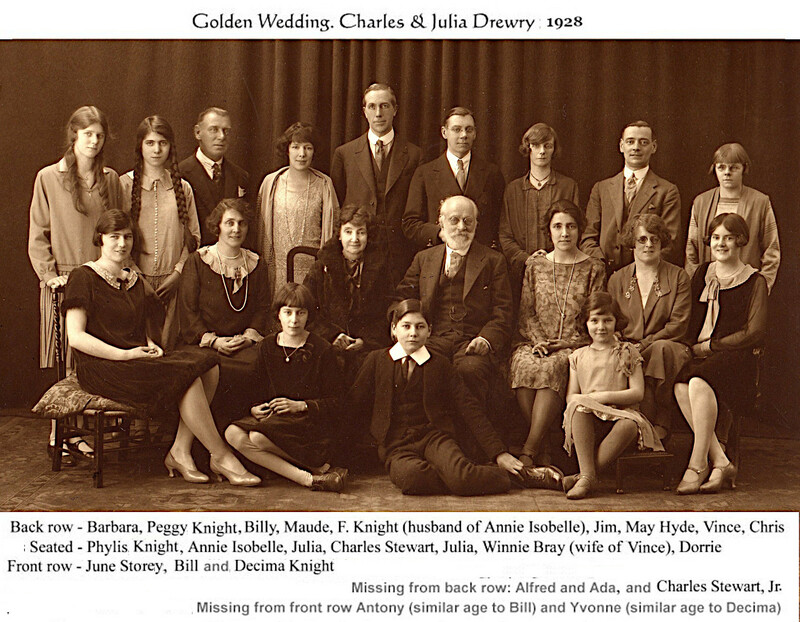 In 1910, James got married. Did James and May then move to Birmingham? 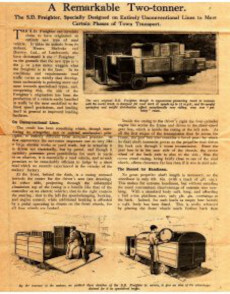 James almost certainly was moving to manage the production of Rail Cars at BSA in Birmingham. In 1913, James' and May's second daughter was born in Bedfordshire - so the sojourn in Birmingham probably did not last long. 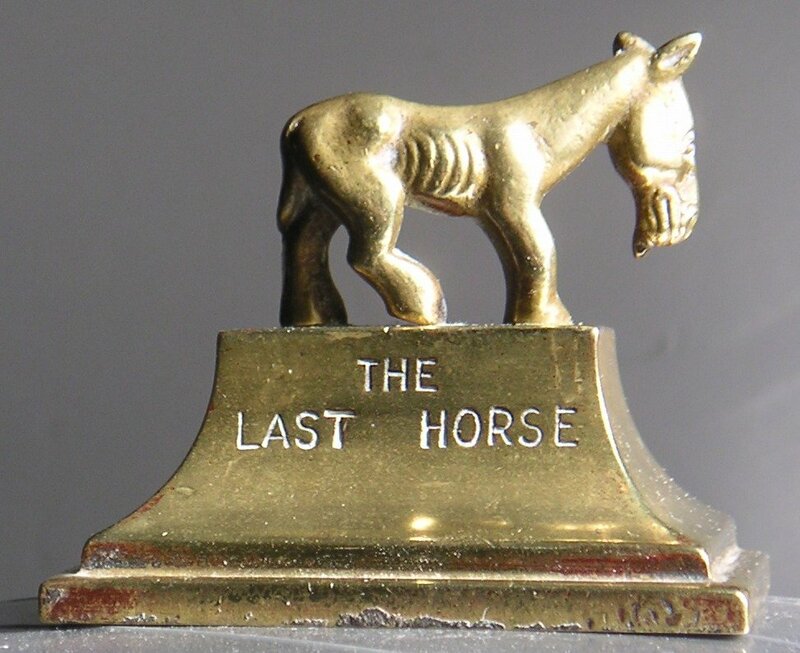 One gets the impression that James moved on to new things quite quickly once he had completed a task successfully. Cecilia Pinckney is the daughter of Ann Easton Wood, James' aunt, and Thomas W Pinckney. Ann Easton Wood is sister to James' mother: Julia Fava Wood. 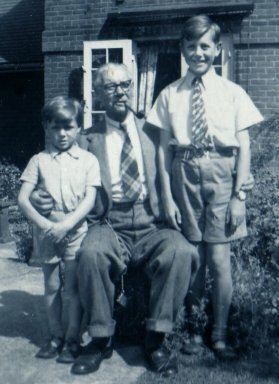 In the National Register of September 29th, 1939, James and family are shown living at 11, William Way, Letchworth. 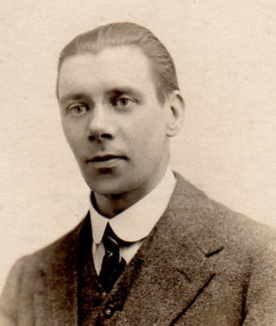 There are four others in the house: Frederick Dainton, an ARP Warden aged 30; and three whose records are redacted. 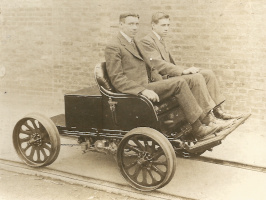 James is described as: 'Designer Transport Machinery M.I.A.E Company General Manager'. 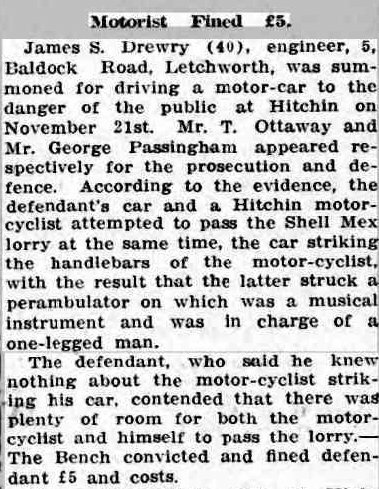 Jim died in Hitchin, aged 70, in 1952. 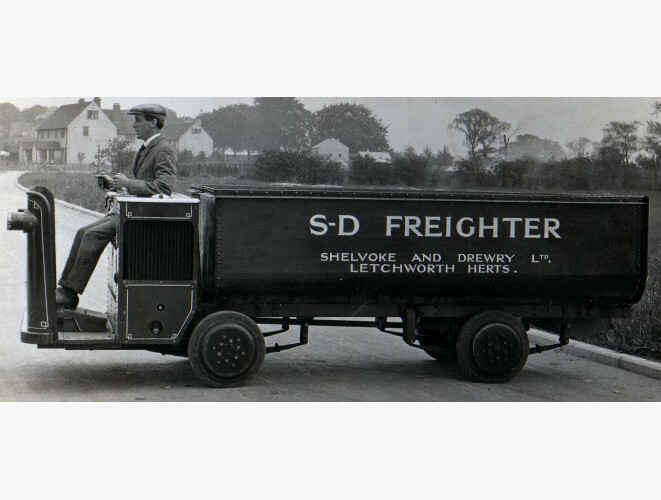 "A website created to preserve the name and history of Shelvoke & Drewry Ltd., of Letchworth, Hertfordshire. 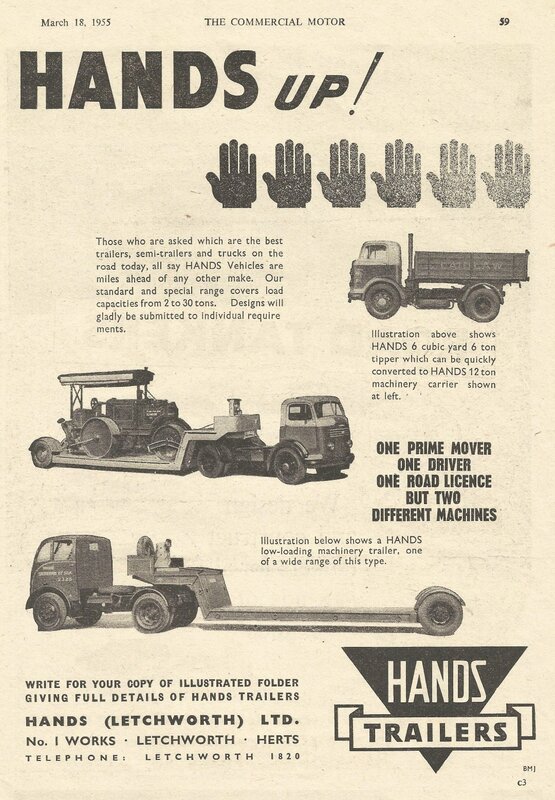 U.K. who were manufacturers of municipal vehicles for almost 70 years." 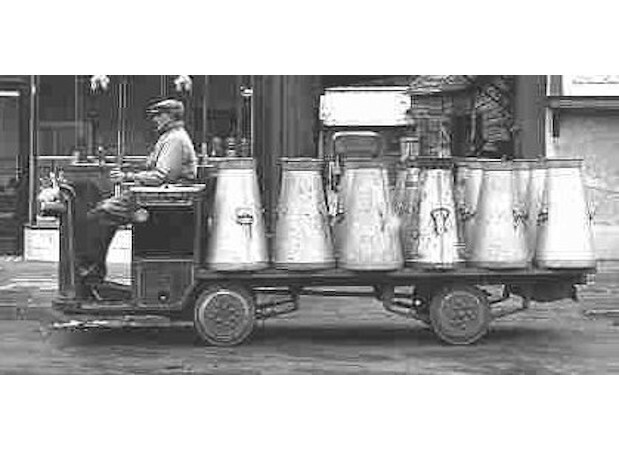 The S & D Site is manageded by Brian Carpenter, who sent me the above extract from 'Kaleidoscope of Shelvoke & Drewry'. 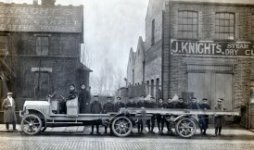 The site is informative with news items and details of 'S & D Remembered' gatherings in Letchworth. 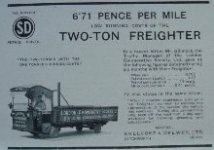 Brian would particularly like to know the connection, if any, between James and later Drewry railcars. Brian can be contacted via The Unofficial Shelvoke & Drewry Site. "McCreath Taylor's works at Flush Park Industrial Estate, Knockmore Road in Lisburn, Northern Ireland, have a beautifully restored Freighter as well as a number of other S&D vehicles.